India is definitely a land of diversity in its landscapes, language, culture and more. It has become the ideal vacation place because its beauty and vastness have transformed it into a culturally rich paradise. There is something for everyone to enjoy depending on the season, budget, reason and mood of your vacation. Even the Monsoon season will not derail your vacation with spectacular places to visit in August in India; you can find an abundance of adventure, fun activities, and enjoyment in a vacation to India. Whether you want to unwind while the sun peeks out from clouds or explore the exotic locations, the monsoon season can create a one of a kind vacation destination. Whether you travel to Munnar on your honeymoon, with your family or with an adventure group, it is the perfect place to fall in love with all it has to offer. Enjoy the vast tea plantations, cliffs, streams and mountains. This is a great place for trekking, bird watching, sightseeing or hiking. The monsoon season brings new life to Munnar. Visit one of the many wildlife parks to see the beautiful greenery and animals in their natural habitats. Or enjoy the great architecture and history of the temples and churches. With beautiful views overlooking the town and an abundance of rich cultural history, there is something for everyone. Full of green mountains and beautiful landscapes, Kodaikanal truly lives up to its name - “The Gift of Forest.” Experience the nature lover within you by visiting any one of the cascading waterfalls, scenic lakes, parks or Bison Wells Wildlife sanctuary to witness exotic animals in their natural habitats. Take a bike ride through the mountain roads to explore the many beautiful temples and churches, or watch as this hill station gets a fresh new look as you enjoy the aroma of fresh rainfall. The view of coffee plantations, rivers and waterfalls makes this a truly tranquil place. As one of the places to visit in August in India, Coorg is deeply rooted in its spiritual history and full of elegant temples and Gothic style churches. You will also find a vast history in its forts and palaces. Waterfalls and rivers provide a beautiful backdrop to the coffee plantations and wildlife sanctuaries. The spectacular views are perfect for sightseeing as you enjoy the cool breeze and pleasant weather. Known as the “Niagra of India,” the falls of this hill station are perfect for a monsoon vacation. Get a picturesque view of the breathtaking landscape. Hike the path to the falls while you enjoy nature. Listen as the birds sing along with the waterfall. Athirapally is great for sightseeing and enjoying its calming wilderness. Breathtaking wildflowers consume fields of lush greenery. 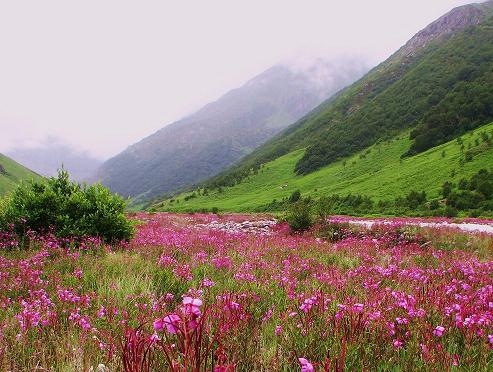 With the nourishing of monsoon rains, wildflowers take their full blossoms from July to August, which is definitely a wonderful time to visit this stunning place. Take a 15-17km hike up the mountain trail to explore this natural habitat. With around 300 varieties of flowers, you are sure to see a sea of color against a background of snowcapped mountains. Feasts, festivals, spices and traditional foods allows fantastic off season vacationing. Enjoy tranquil time on the beaches without crowds, or explore the rest of Goa. Goa has a wonderful colonial past just waiting to be explored. Or, enjoy traditional Goan food in a restaurant. During the monsoon season in Goa, you can experience the Sao-Joao festival or the feast of Saints Peter and Paul. Or, enjoy the new liveliness of the gorgeous cascading waterfalls and parks. All these make it one of the best places to visit in August in India. The monsoons improve this city’s beauty. Mandu is a fortified city on a rocky outcrop amongst a field of green. It becomes a beautiful red during the monsoon season, making the mahals and darwazas even more amazing. Delve into the rich history of this city and its love story of Rajput princess Rani Roopmati and Baz Bahadur, the last sultan of Malwa. Get a history lesson as you explore the tomb of Malwa’s second king Hoshang Shah and the courtyard of Roopmati’s Pavillion. Gain a sense of calm as you explore this breathtaking landscape dotted with monasteries and prayer flags. Visit this unique mountain desert to explore its one of a kind culture. Experience the unique customs, myths and beliefs for a truly unique vacation. The beautiful landscape of snow-covered mountains is enticing to hike and explore the natural grandeur of the natural scenery. Located between the two highest mountains in the world, the Himalayas and the Karakoram, Ladakh has an unbelievable landscape of contrasting terrain. Enjoy peace and quiet while visiting the monasteries and learning about the rich Buddhist culture. Dive deep into the culture as you experience the colorful festivals. Or, enjoy the eye-catching beauty while you trek through the lunar terrain of the desert. Discover the natural beauty the crystal clear lakes and rugged terrain while you take a jeep safari or cycle through the landscape. Visit these two small towns, located in the lush greenery of Madhya Pradesh, for an experience off the beaten path. Medieval architecture accentuates Orcha’s medieval culture. 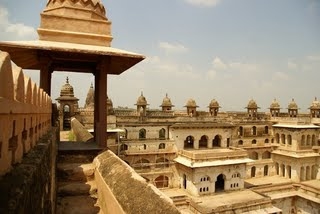 Enjoy the medieval heritage of Orcha Palace and the Ancient Ram mandir. Experience life in Orcha as you bicycle through town or raft down the river, or enjoy local food while you relax in the nearby forest reserve. Get completely out of the chaos and visit Panna which is located deep within the forest. Find the isolation and relaxation that you want within any of the resorts.